My Grandma collected cookbooks and I am a sucker for anything of hers. So when my Mom was cleaning out her cookbooks I took one titled Food from the Frontier. My Grandma had bought this book in 1975 when the book was published because it detailed the types of foods and cooking practices used in Minnesota in the mid 1800’s, which was when her grandfather homesteaded there. I know this because she inscribed the front of the book with the date and reason for her purchase and our genealogy. Family and food are important to us. 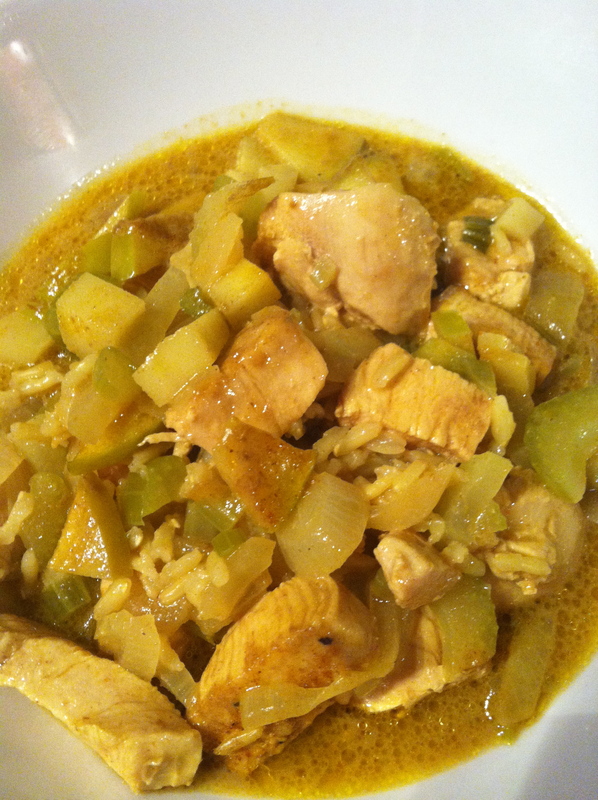 As I flipped through the pages, I was surprised to see a recipe for Chicken Mulligatawny Soup. I had no idea that this common dish was such an old, traditional meal. The traditional recipe called for curry powder, which I thought was trendy, not an old favorite! 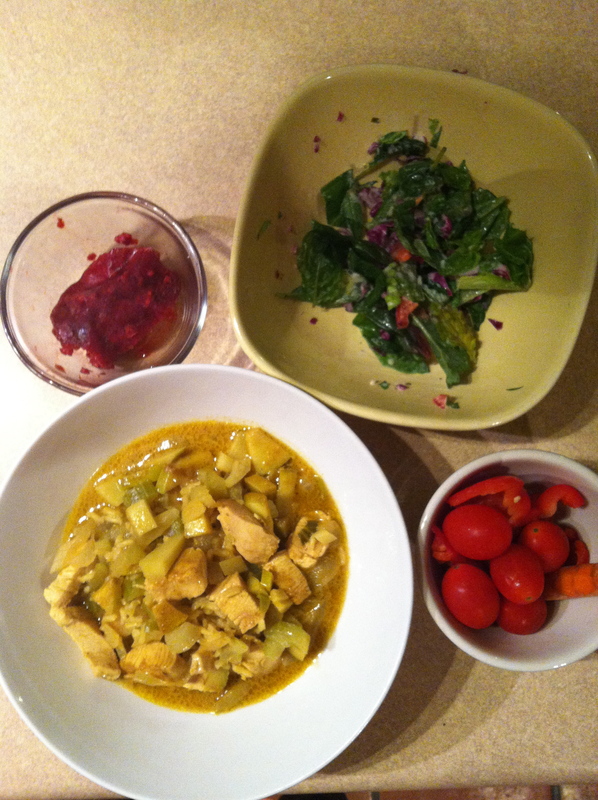 I do love curry; I love that it tastes so good and is so good for us. It’s full of anti-inflammatory antioxidants. I made the dish based on the 1850 recipe and it was delicious, but when I made the recipe again, I couldn’t help but give it a few more twists. I added a little extra spice, apple for a touch of fall and some delicious coconut milk. I increased the bulk with extra onion and celery, and added more brown rice so that it’s a balanced, one-dish meal. *For those with celiac and gluten sensitivity, ensure that these ingredients are gluten-free. Dice onion and celery. Place onion and celery a large deep skillet or a dutch oven. Add olive oil and garlic and sauté over medium heat. Dice the chicken and place in skillet. Add brown rice to the skillet and mix it all up a bit. Add the broth and turn up the heat to medium high. Bring to a boil. While the broth comes to a boil, dice the apples and then add to the pan. Mix in the spices, coconut milk and lemon juice. Once it comes to a boil, cover the pan and turn the heat down to medium. Allow to simmer until the chicken and rice is cooked through. We served it with a green salad, cherry tomatoes and frozen raspberries.